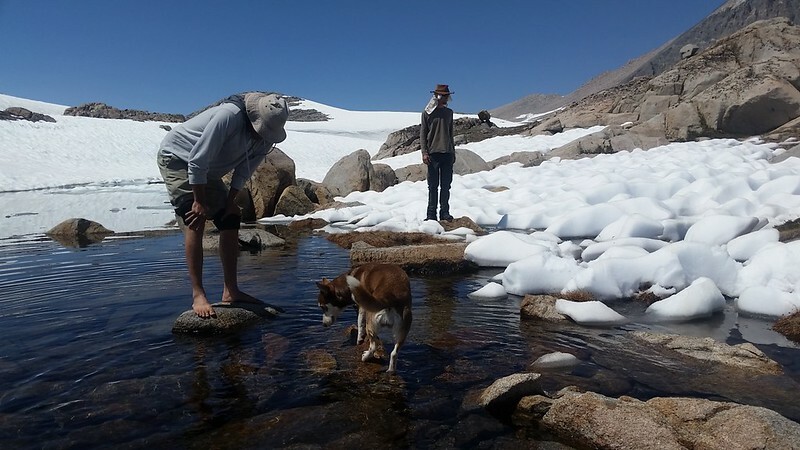 I took my son, his friend, and his dog on a backpacking trip to Humphreys Basin via the Paiute Pass Trail over the July 4th Weekend. 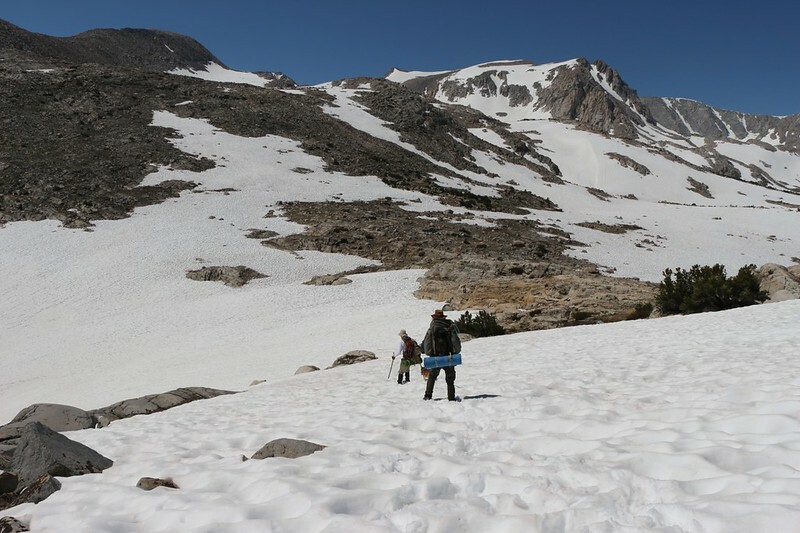 This year, 2017, was already known to have a record snow pack, and all of the online information that I could find said that we would be climbing on snow up above 11,000 feet elevation. So we came prepared, purchasing ice axes and microspikes well in advance. We were ready! Well, almost ready. 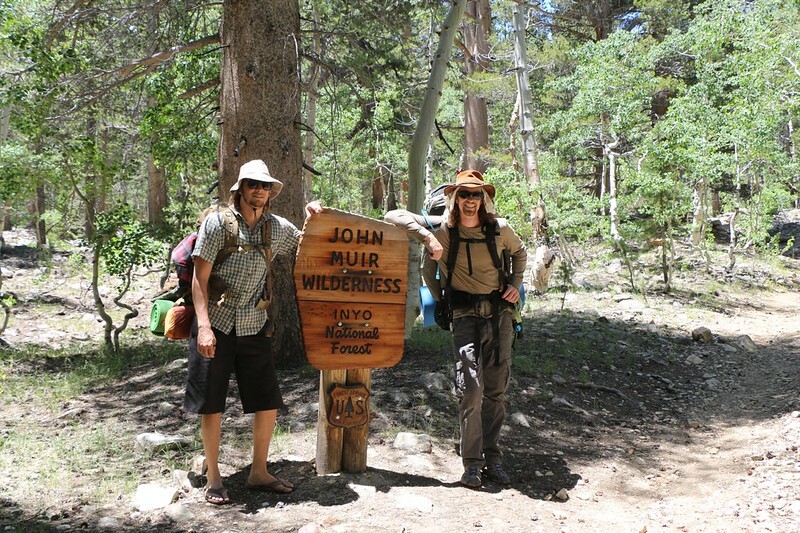 We planned this trip a bit late, so we didn’t have a wilderness permit to backpack anywhere. Therefore, it was MY job to head up north a day early and get the permit. Otherwise, the entire trip would have to be called off. And that’s what I did. 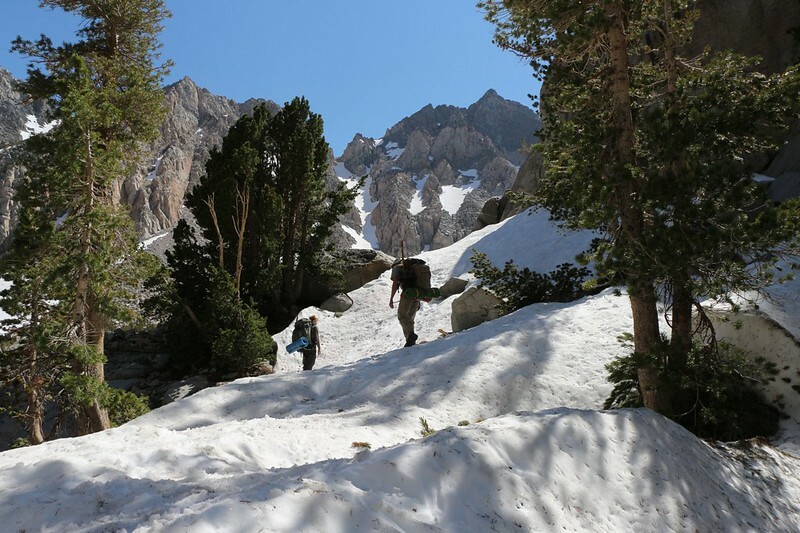 We didn’t get our first choice, but we did get our second option: The Paiute Pass Trail. I texted my son that his dog was welcome to hike with us in this area, and that I’d see him Saturday morning bright and early. Then I drove up to Horseshoe Meadows and spent the day (and night) getting acclimated to high elevation. 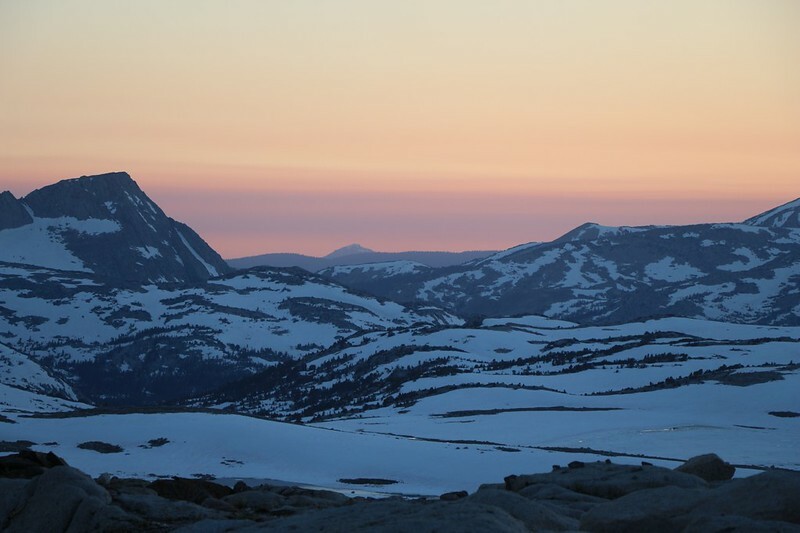 I woke up early, at first light, and began packing up my gear. The boys had texted me that they wanted to meet me at the Lone Pine Ranger Station at 8AM. My plan was to head down into town and eat breakfast first. During the meal I received another text stating that they were running late. 9AM or so. I sighed. There wasn’t much that I could do, so I went to the Ranger Station and organized my gear in the parking lot. But it was mostly organized already, so I went inside and sat down in a comfy chair and read my book for a while. I even nodded off a bit. They arrived eventually. I wasn’t mad because I was on vacation, and it didn’t really matter what happened as long as I was enjoying myself. I’m good at doing that, so no problem! 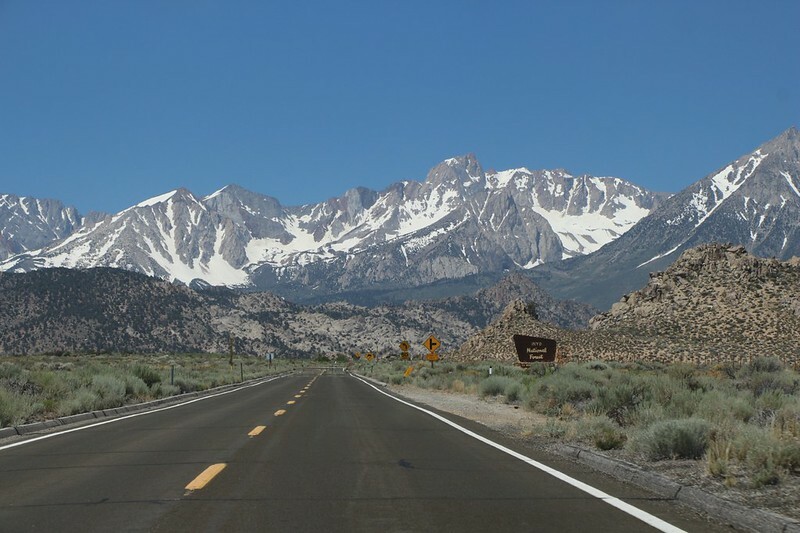 We headed on up Route 395 to Bishop, and it was a beautiful drive. We grabbed some lunch at a fast-food joint and headed west on Highway 168 toward North Lake. It was exciting to see the snowcapped mountains getting closer as the road climbed higher. Finally, we turned off on the dirt road to North Lake and parked in the Day Use Parking lot, as the road to the trailhead had gotten washed out the week before. This was sad, but it only meant an extra mile of hiking on a flat road, so we were fine with it. It didn’t take too long to get ready at the trailhead. 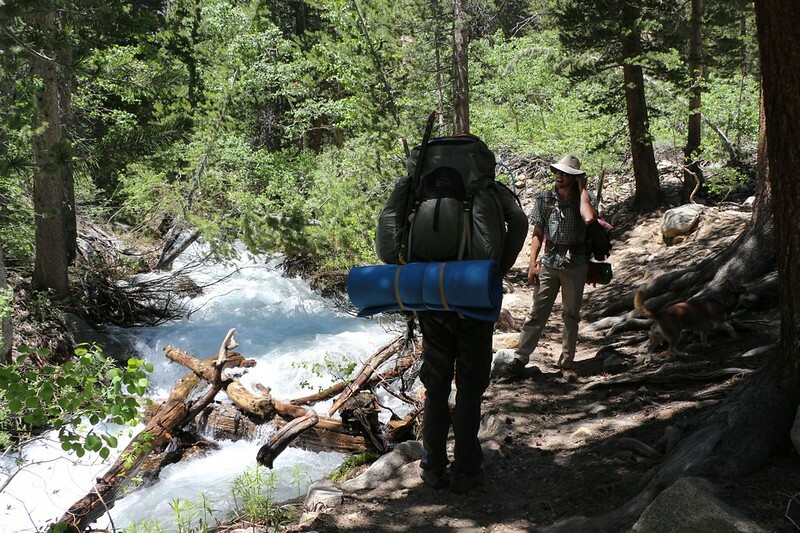 We put on our hiking shoes and got the packs fully packed. We stowed the excess gear and food in the trunk as there were no bear boxes here. All in all, we ended up starting our actual hike just after noon. Yes, it was later than I’d originally planned, but who cared? 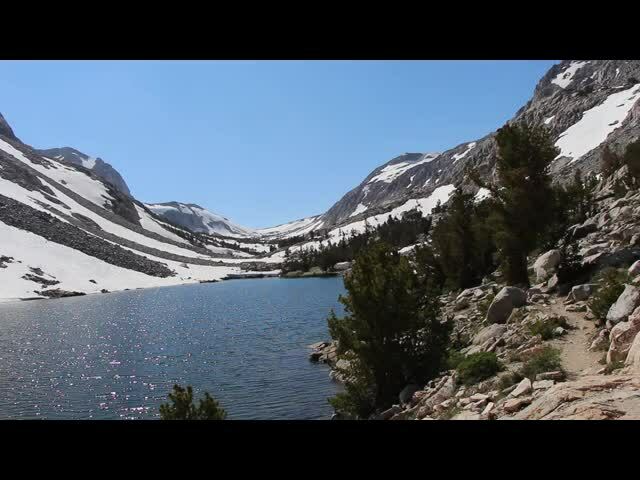 We were hiking in the High Sierra! It’s hard to get better than that. We hiked along the dirt road and checked out the washout damage. The water was still flowing strong, but at least it wasn’t over the top of the road any longer. We hiked past North Lake and the fishermen casting their lines hopefully. 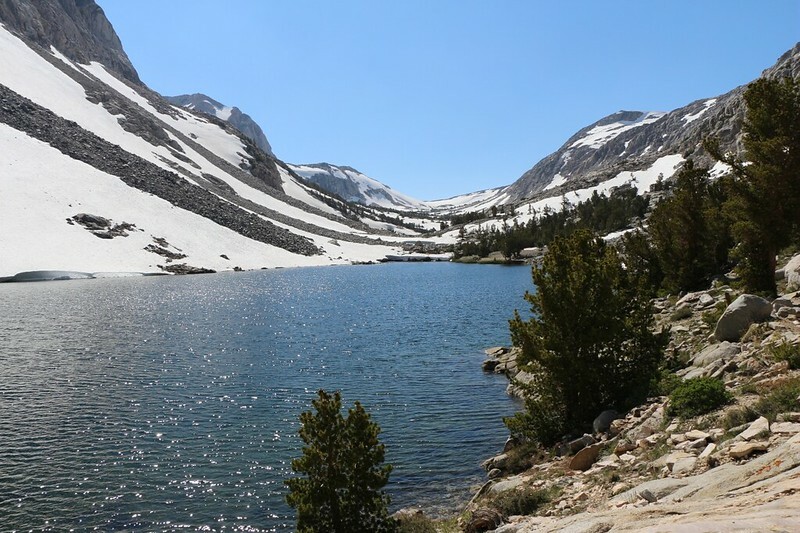 We hiked on through the North Lake Campground (which was technically still closed for Winter) and entered the John Muir Wilderness. After that the trail began to climb in earnest. 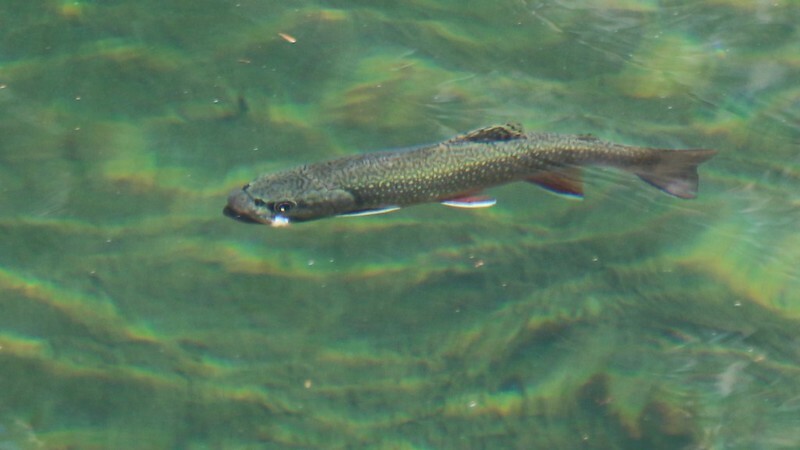 It generally followed the course of the North Fork of Bishop Creek, which was running strong. It was obvious that there must be a whole lot of melting snow up higher in the canyon. 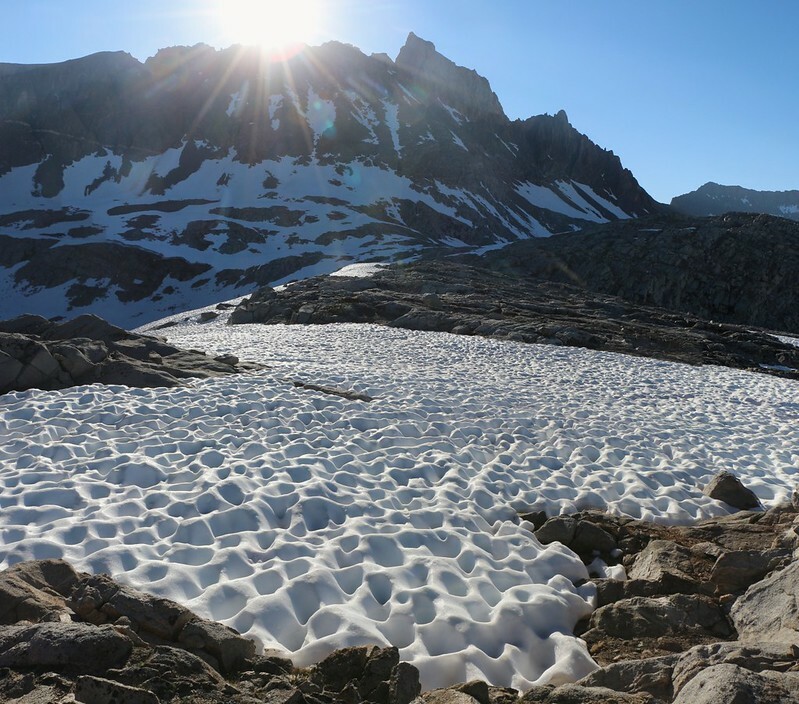 We were looking forward to it, and we were ready for it; each of us were carrying microspikes and ice axes, just in case. The trail was steep enough and we built up a decent sweat. When we stopped in the forest the mosquitoes came out in droves to feast on us, and we applied some DEET to keep them at bay. Soon enough we climbed up beyond the treeline and the views got better with each step. The creek was roaring down below us and the snow-laden mountains were on each side. The bugs went away as a cooling breeze sprang up, and we hiked on happily, with the dog seeming to have more energy than all three of us combined. She probably covered at least three times the distance, as well, running ahead, then back, then darting from one interesting smell to another. “She won’t be like this when we get to the snow” I said, but my son only laughed. “She loves the snow! You should have seen her on Mount Gould!” he said. I groaned. I had forgotten that this dog was a thirteener! Well, at least we wouldn’t have to carry her. And then, true to form, when we came across our first little mound of melting snow the dog went crazy. She started rubbing her face on it, and eating it, and darting back and forth on it. With her claws, it was like she was already wearing microspikes and had her four-paw-drive fully engaged. Impressive. Eventually we reached the headwall just below Loch Leven. And there was plenty of snow. 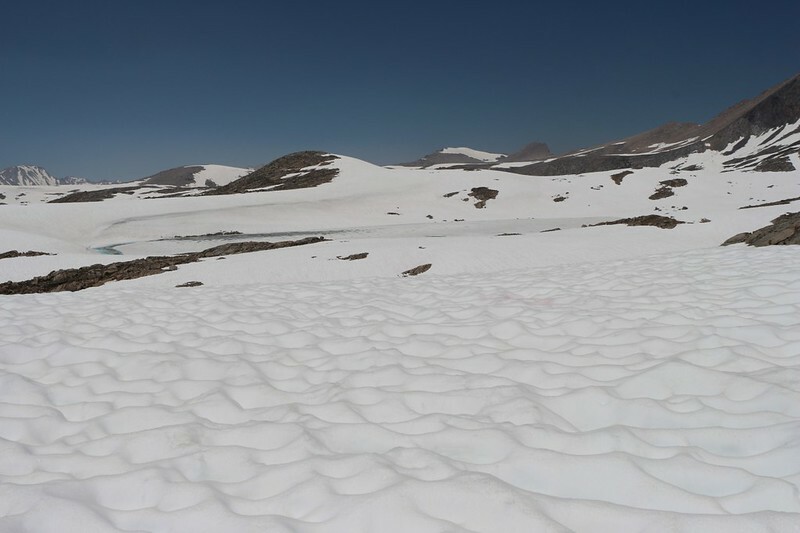 In fact, the trail disappeared beneath the snow, and since it was melting so rapidly it was difficult to see tracks more than a day old. They simply blended into the already-deep suncups and became indistinguishable from any other mark. The snow at the headwall looked steep enough and deep enough to warrant getting out our microspikes and ice axes. Yes! We were glad we carried them. The spikes gave us some extra traction and the axes were really only there for support, or in case we slipped and had to self arrest. 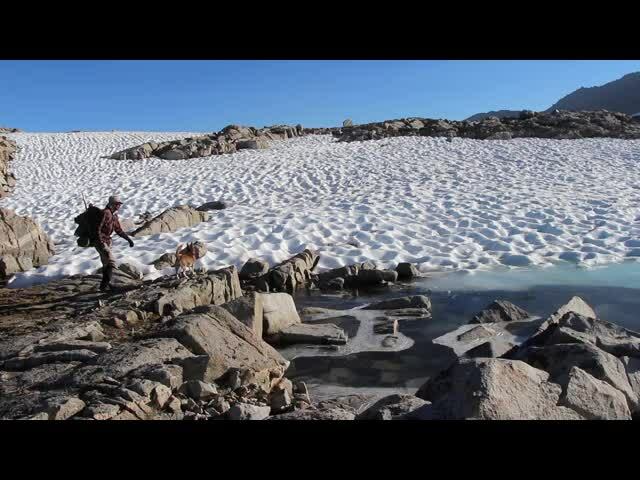 None of us had ever used ice axes before. Earlier, I had sent the lads a link for some youtube tutorials on self arrest. I asked if they’d watched them, and they had. Then I sheepishly admitted that I hadn’t bothered doing it myself. Yes, I was a bad dad. We climbed and sweated our way across and up all that snow below the headwall, and arrived at Loch Leven, which had already melted, even though it had plenty of snow still touching its edges on the south side. We were tired and took a bit of a break next to the lake. It was breezy and it felt great to cool off. Up at the head of the canyon we finally got a glimpse of Paiute Pass, and it looked pretty darn far away. It also looked like we’d be climbing on yet more snow to reach it. 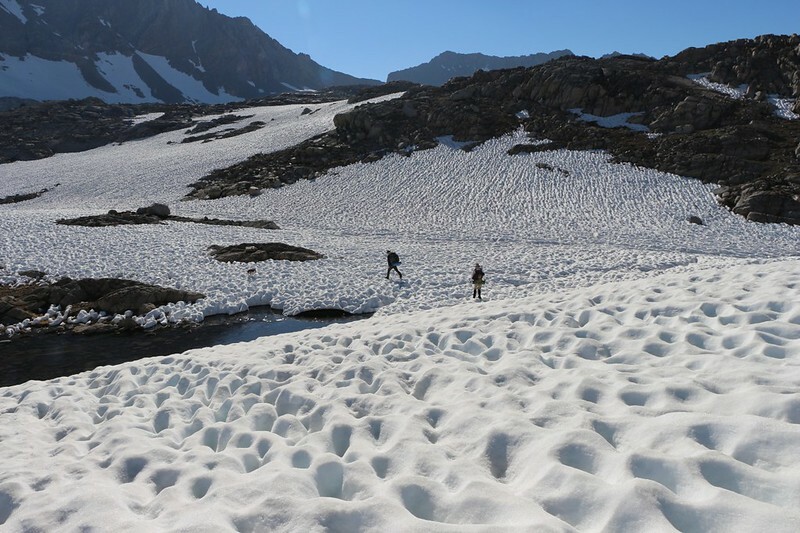 After this last bit of hiking we felt confident that crossing the snow would prove to be easy enough when the time came. Meanwhile, we’d have to get there first. 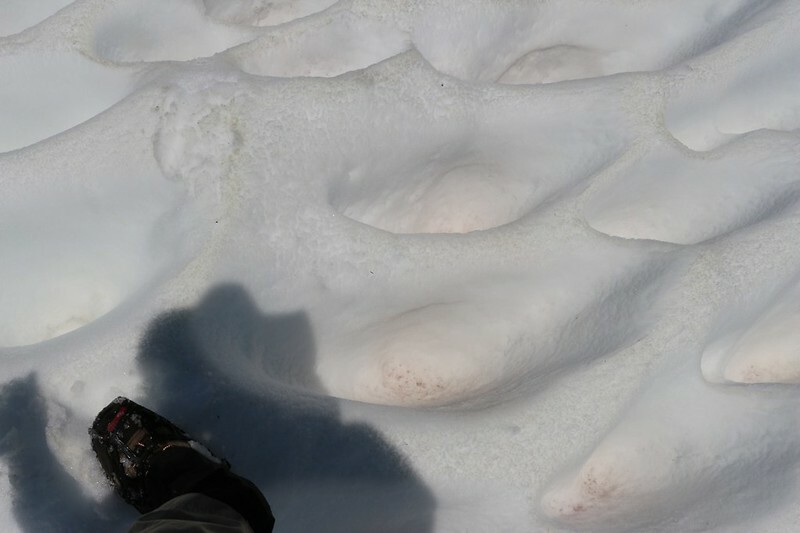 And there was plenty of snow along the way, although there were large sections of bare ground as well. The result was that we put on and took off our microspikes many, many times. Technically, it’s OK to leave them on all the time, but when walking over bare granite slabs they felt a bit sketchy, like there was very little traction. 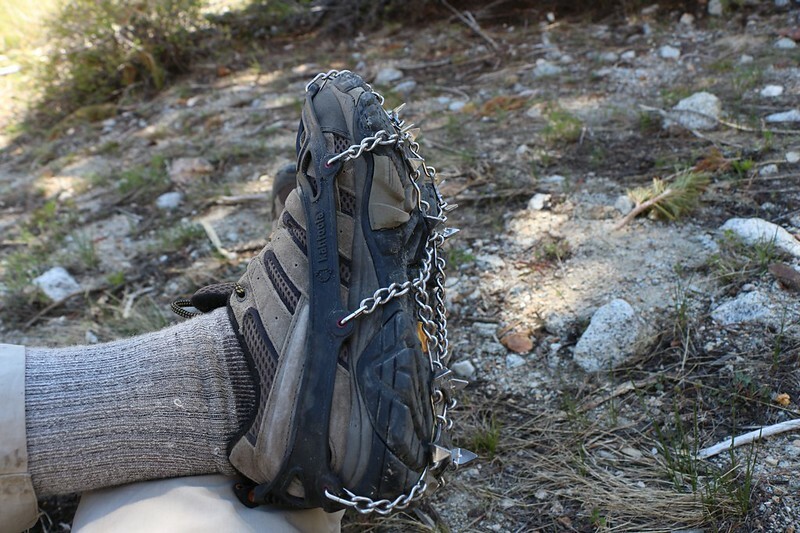 Plus the rock dulls the points (not that they are sharp like crampons) and wears them out sooner. We finally arrived at Paiute Lake about 6PM. We were pretty tired. I checked the GPS and we’d only hiked about four and a half miles in six hours. Pretty sad. We blamed the late start and all that snow. Meanwhile, it was another mile or so to the pass. And then what? Where would we camp? It was already getting late and the temperatures were dropping. We’d never make it all the way to the Humphreys Lakes. And here we were next to this beautiful lake. We took a vote and the lake won. 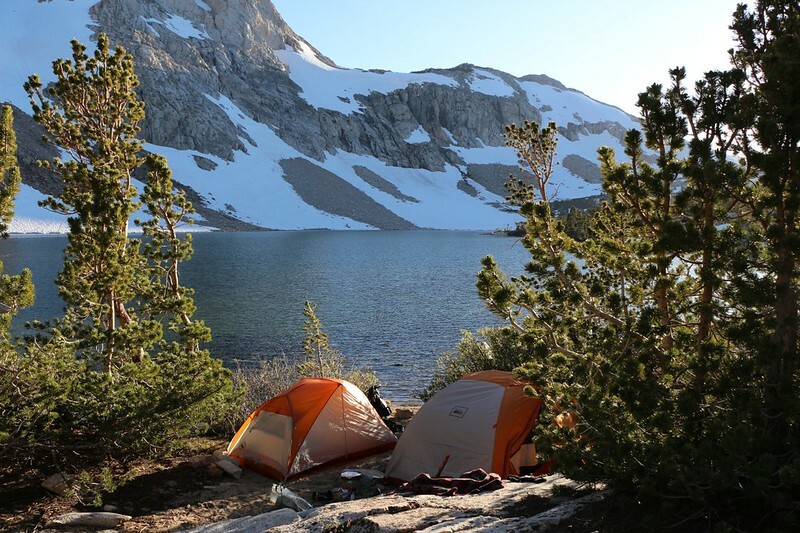 We’d camp here for the night and hit the pass early. By then the snow would be icy again, and the microspikes would work even better. We found a dry spot near the shore of the lake (everywhere else was covered in snow) and set up camp. My son discovered that his MSR Whisperlight stove was semi-clogged and would barely burn. The water was taking forever to boil. So I whipped out my little Jetboil MiniMo and had dinner ready in two minutes. What a difference! We sat and watched the lake as the sun set behind the pass. It was very peaceful. 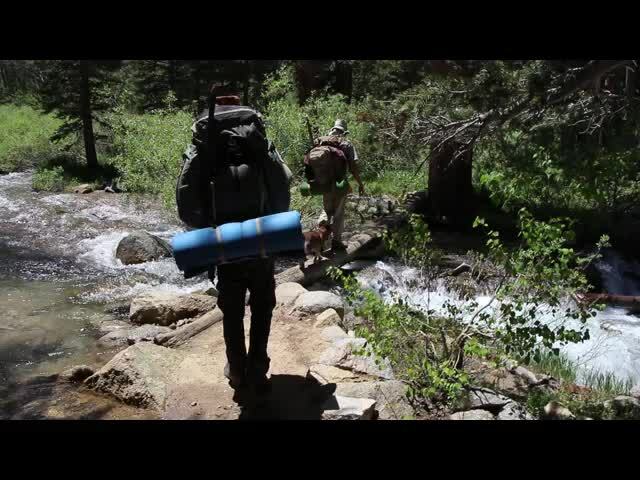 We talked about the trail, about how we’d met so few people. We looked at the map and made plans for tomorrow. And I had to agree with them that the dog was a true snow dog. If we could walk on the snow like her we would’ve been miles ahead by now. And then it started getting cold in earnest, and we headed for our tents and sleeping bags. It had been a long day. As expected, I was the first one up. And I knew my duty: Get some water boiling for coffee. It was cold outside, and the snow was crunchy. Yesterday’s puddles now had a skin of ice on their surfaces. The air was calm and the lake made for some fine photographic reflections. It was truly enjoyable to hold a cup of hot coffee and contemplate the snowy mountains and Paiute Pass in the distance. The guys crawled out of their tent and we ate our breakfast. Then we packed up and started hiking as quickly as possible. 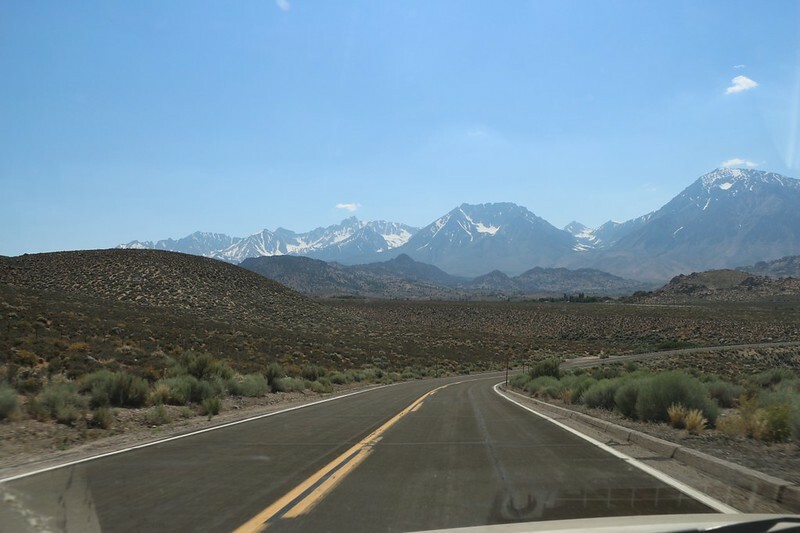 Paiute Pass, here we come! We made it to the pass and took a break. We also took in the view. It was expansive, if a bit hazy. Humphreys Basin was to the west, and it was absolutely full of snow. We knew about this thanks to talking with other hikers yesterday, but the sight of all that snow really brought the point home. 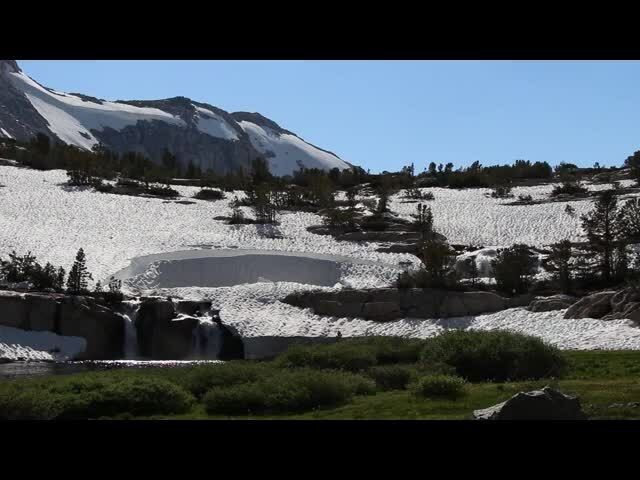 This really was a record year for snow in the Sierra Nevada. Summit Lake, just below us, was still frozen, although you could see where it was beginning to melt out around the edges. Just up the ridge of the pass flowed a strong waterfall which poured down into the canyon to the east. 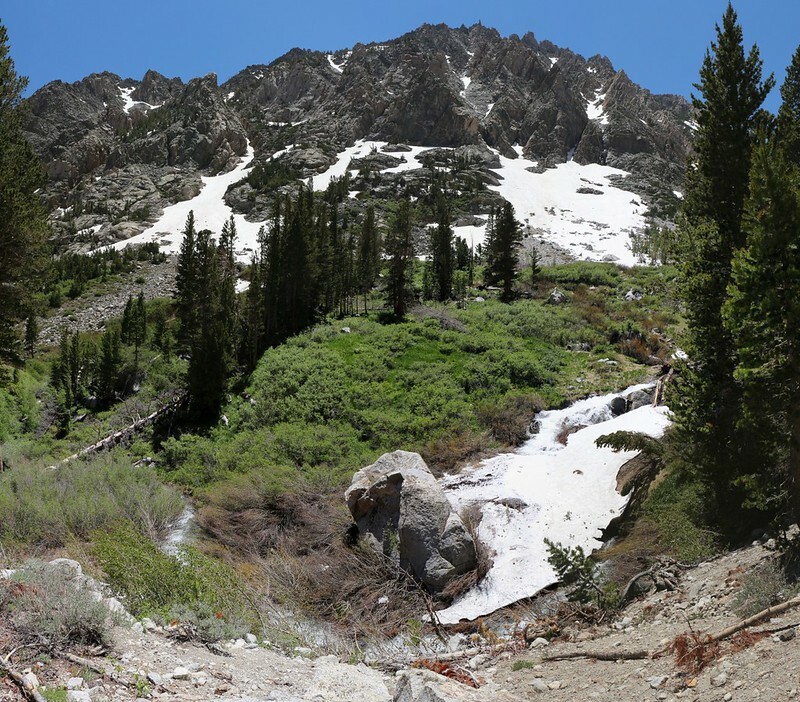 This was the headwaters of the North Fork of Bishop Creek. 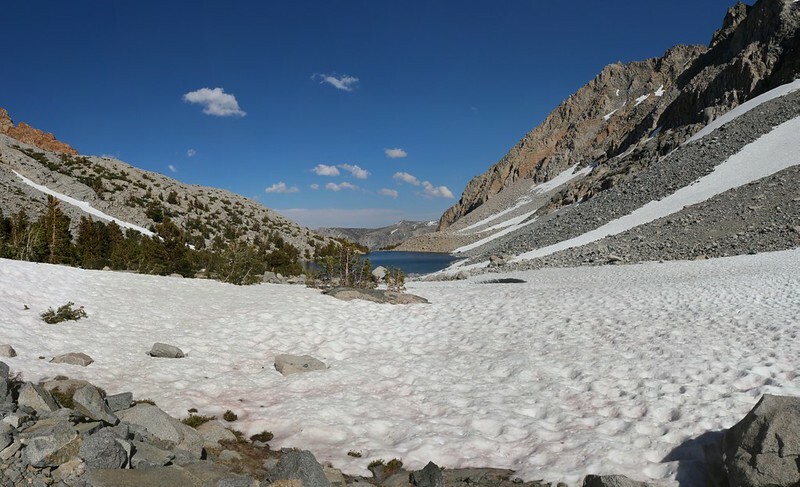 We realized that all of that water had been flowing somewhere underneath that long traverse of snow to the pass and we hadn’t even known about it. Plunging through the snow into icy water wouldn’t have been much fun and we were glad we left early while the snow was extra solid. 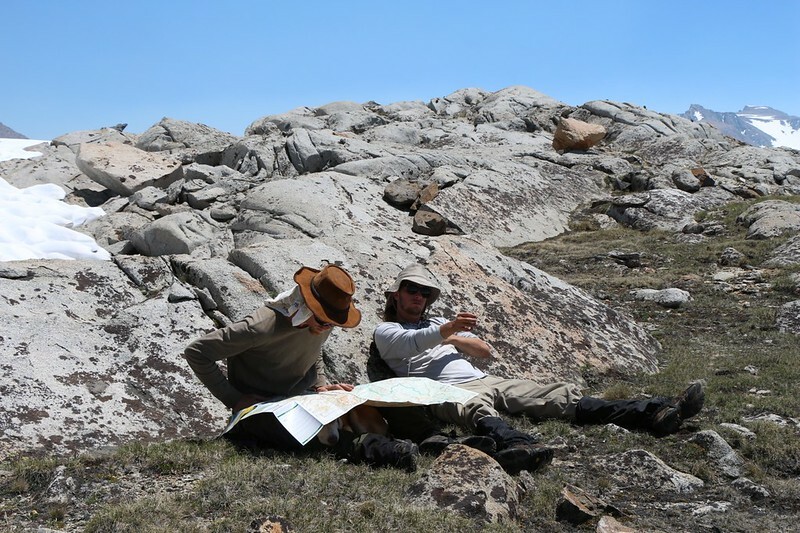 We checked the map and it showed a trail heading directly north from the pass toward the Humphreys Lakes. At first we were able to follow it, but eventually it, too, became buried in the snow. The granite ridgetops were snow-free, thanks in part to the howling winds of earlier Winter storms, and we tried our best to walk on them when they led toward our goal. 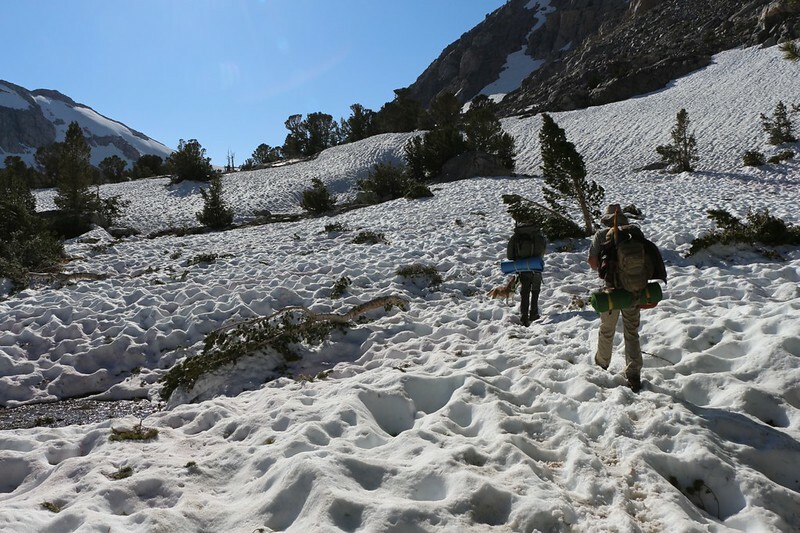 But all too often we had no choice but to traverse long stretches of heavily suncupped snow. And the suncups were deep, many of them three feet deep. So we had to try our best to keep our feet up on the tops of the cups, and it wasn’t easy as the day got warmer and the snow got softer. Stepping in shallow suncups was safe enough. When you tried to stay on the top, every so often the walls between the deep suncups would break down and you’d plunge to the bottom, getting thrown completely off balance. Then you’d have to step way up high to get out of the hole. It was a bit dangerous unless you hiked really slowly, and that’s what we did. It took a long time to get anywhere under these conditions. As we neared the Humphreys Lakes, Mount Humphreys (elevation 13,986 feet) began to dominate the area. 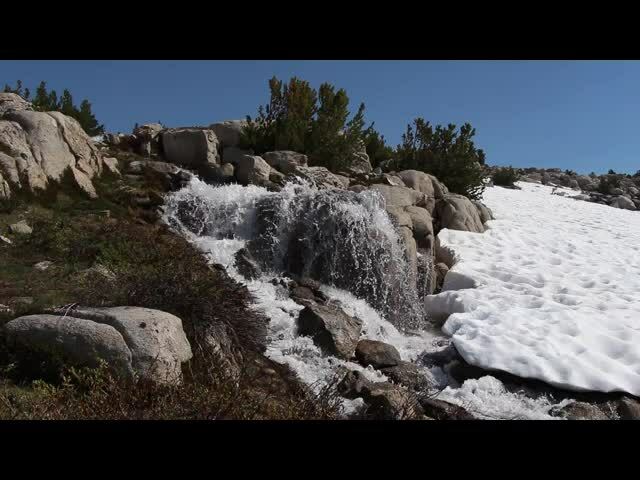 Now we knew why it was called Humphreys Basin: Mount Humphreys owned the entire thing! And it owned the lakes, too. All of which were quite frozen, with cool-looking blue ice showing on their surfaces. 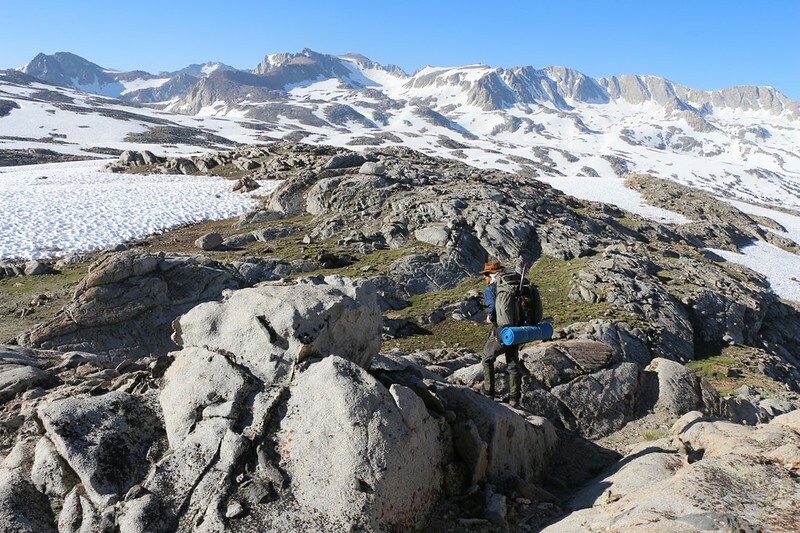 I had asked the young men to read Bob Burd’s description of the ascent of the southwest side of Mount Humphreys, since they seemed like the kind of guys who might want to try something like that. I was too old for moves like that, I told them, and volunteered to stay in camp with the dog while they climbed. I watched their faces as I pointed out the route, paying particular attention to the final airy Class 4 section near the top, where one false move meant almost certain death. For some reason, their enthusiasm for the ascent diminished considerably. We found vantage points and checked out several of the Humphreys Lakes, but they had too much snow around them to be camp-able. So we took a break for lunch and got out the map. It was already 2PM and we’d been hiking for six hours while covering only three and a half miles. These suncups made rough bushwhacking seem fast! The real question at this time was: Where would we camp? 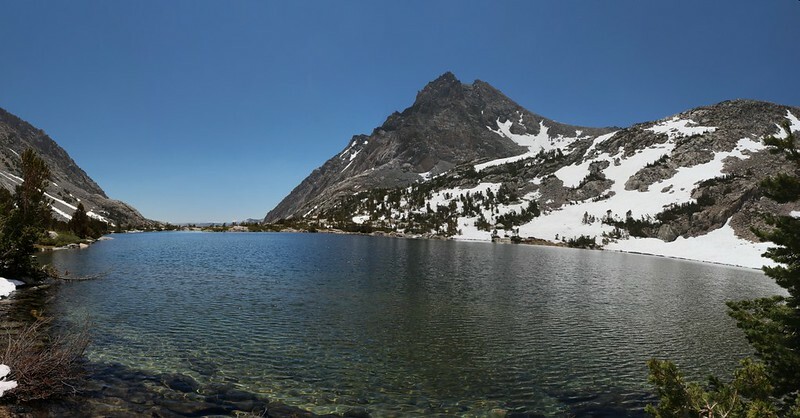 We had originally planned on hiking down to Desolation Lake, the largest lake in Humphreys Basin, but it sure looked far away on the map. In fact, we couldn’t even see it from where we were. And that was when we formed a plan. 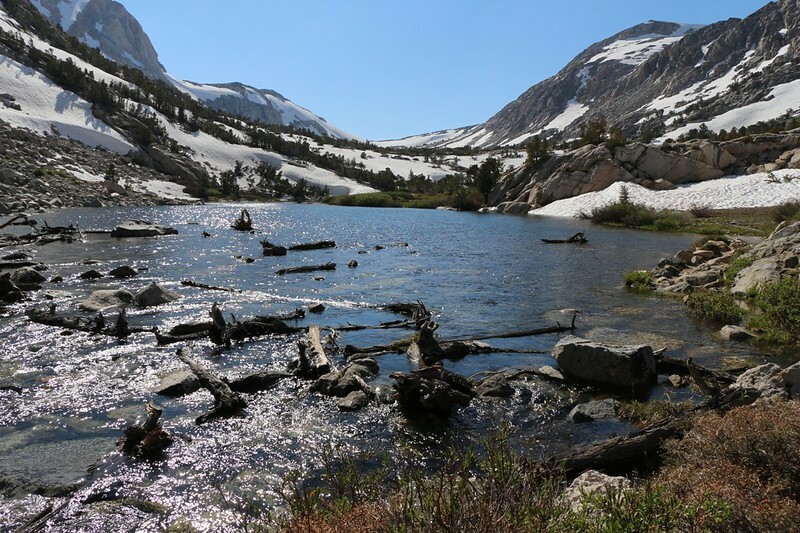 We would hike generally northwest toward Desolation Lake, but would maintain our current elevation and wait until we saw it before committing ourselves to the descent. At worst, we could stay on that high ridge up above the lake. And that’s exactly what we did. After a bit of scrambling and route-finding around a cliffy section we arrived on the high ridge, with Desolation Lake frozen solid down below us. 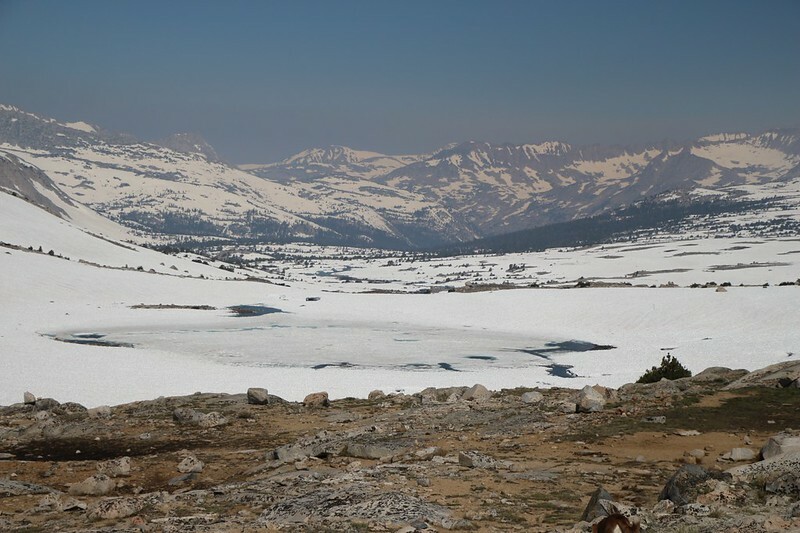 We were up near 12000 feet, and the lake was at 11375 feet. Did we really want to head down there? It was already 4:30PM. It had taken us two hours to travel the last 1.2 miles. Pathetic, I know, but we had worked hard to do it. We figured that hiking downhill to the lake would be faster, so, yes, we could make it there before sunset, but did we want to? The more we looked around, the more we liked this crazy high spot. We had views in every direction! And there was even a small unfrozen tarn nearby for water. 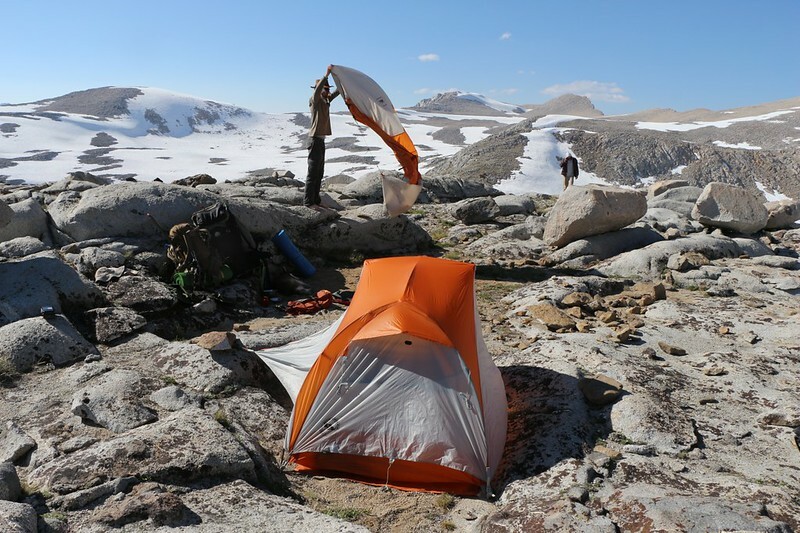 So we wandered all around the ridgetop looking for a spot suitable for our two tents. And of course we found one. Nice and sandy with very few rocks. If the wind picked up overnight we’d be doomed, as it would be screaming over this exposed ridge, but the weather seemed stable. So we set up camp and filtered some water. We tried the lame stove again after a quick jet-cleaning, but it was still lame. So we got out my little stove and cooked up dinner. It took two rounds of boiling but it was still faster. After that, we changed into our warmer night clothes and just hung out in camp. We set up a GoPro to take a timelapse video of the sunset. We watched the alpenglow on Mount Humphreys, and I checked the PeakFinder app on my phone in order to give some names to all those peaks we could see around us. Besides the peaks that ringed the basin, we were able to see Mount Sill, Agassiz, and North Palisade all glowing with color to the southeast. We hung out into the evening as the sky darkened and the gibbous moon rose high above us, lighting the basin below with its silvery glow. A beautiful way to end the day. 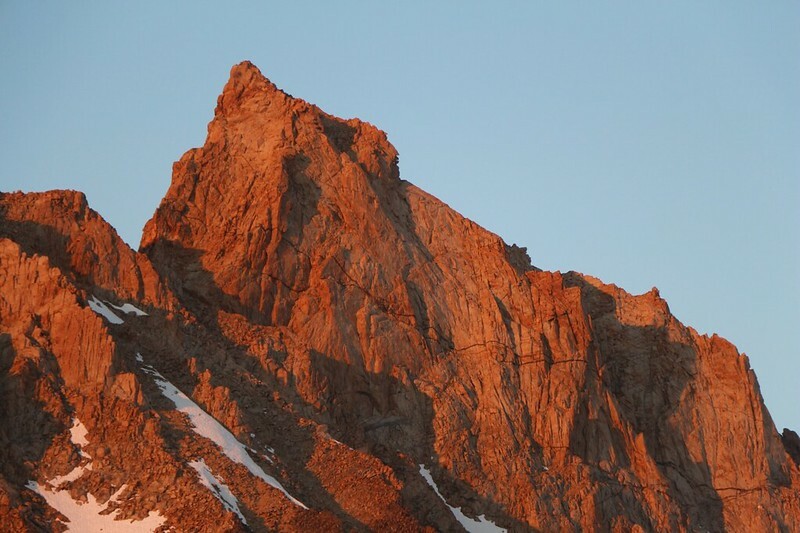 Sunset light on the southeast face of Mount Humphreys. See that airy climbing route up that steep left ridge? Neither do I! We woke up earlier than usual because a gusty breeze had, indeed, sprung up during the night. Mostly the wind was steady, but every so often it would buffet the tent, shaking the poles and flapping the tarp. This is what woke us up. So we got our breakfast together and began packing all of our gear. It didn’t take long, and we were ready to hike by 7:30am, just as the sun rose above Mount Humphreys. I was asking about where we would camp tonight when my son informed me that his friend really wanted to head directly back home today. Well, I was a bit disappointed, but it wasn’t really a problem as I was on vacation. 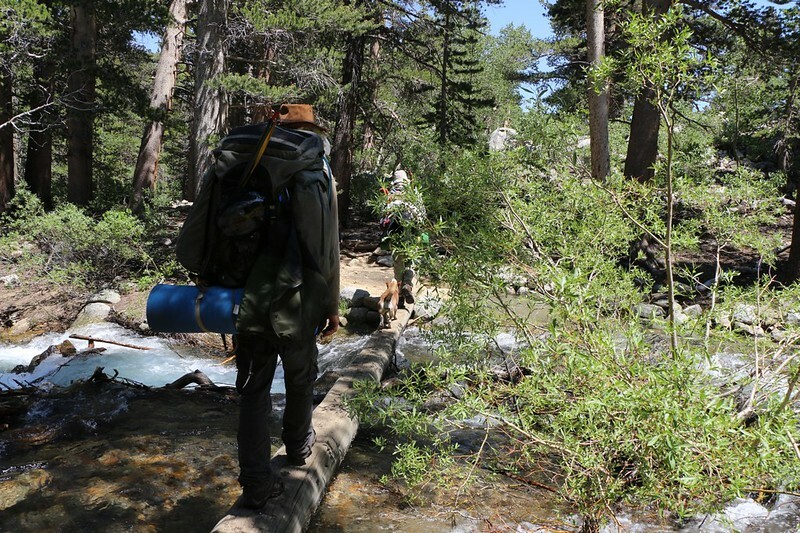 I’d had three nights in the Sierra this trip, and not getting a fourth certainly wouldn’t be the end of the world. If truth be told, I admit that I wasn’t really all that excited about all this snow hiking. Unless you were a dog, these suncups were absolutely brutal to walk on. And look at the bright side: At least we’d be heading downhill! 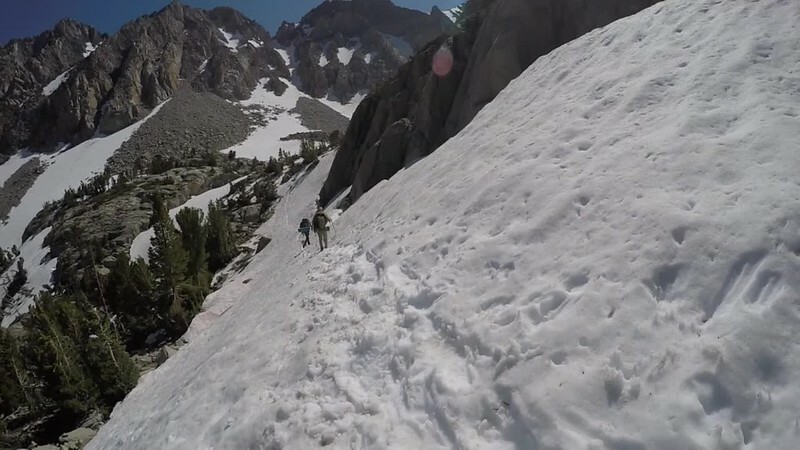 We took a slightly different route back to Paiute Pass this time. 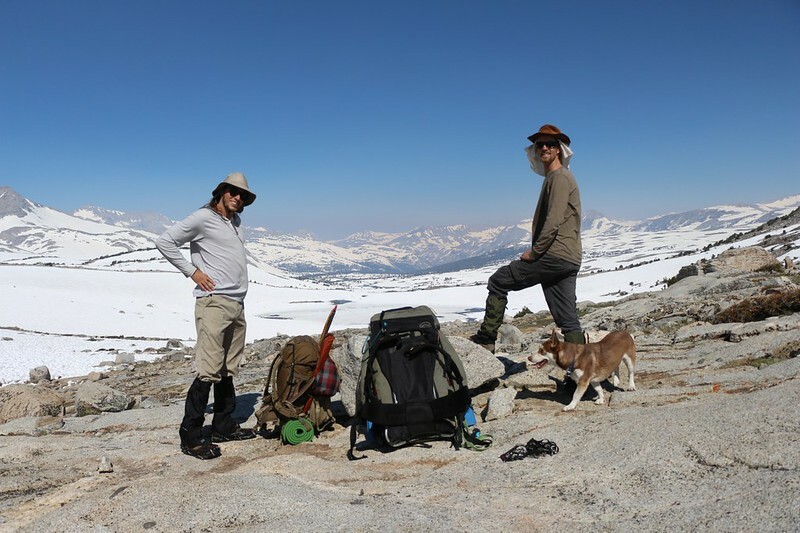 We decided to stay high and follow the bare granite ridgelines as much as possible. In this way we would would make the most distance in the least amount of time. As a strategy it worked fairly well, but there were still way too many sections of snow between the ridges. 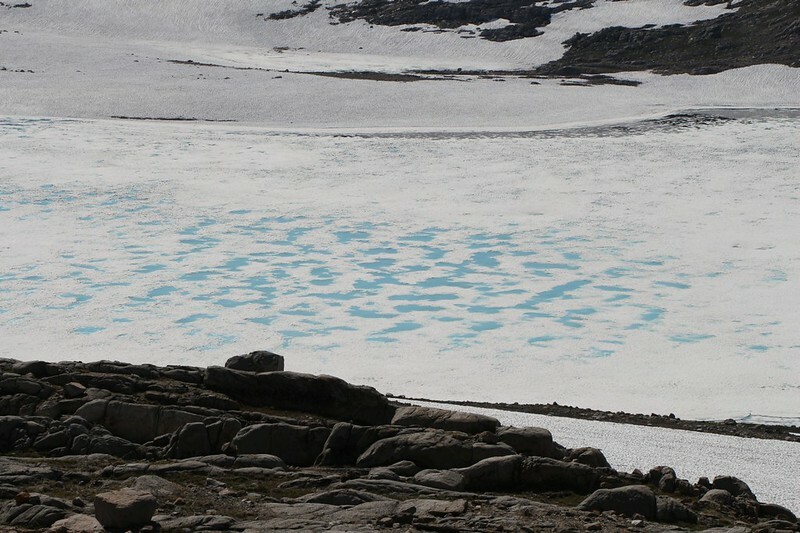 Many of the snowy zones were in valleys, and we knew that there was plenty of icy water flowing under there, especially in the lowest regions. In some spots we could see where the snow had melted, collapsing into the rushing water. In general, we picked our way as carefully as possible over the suncups and hoped for luck. 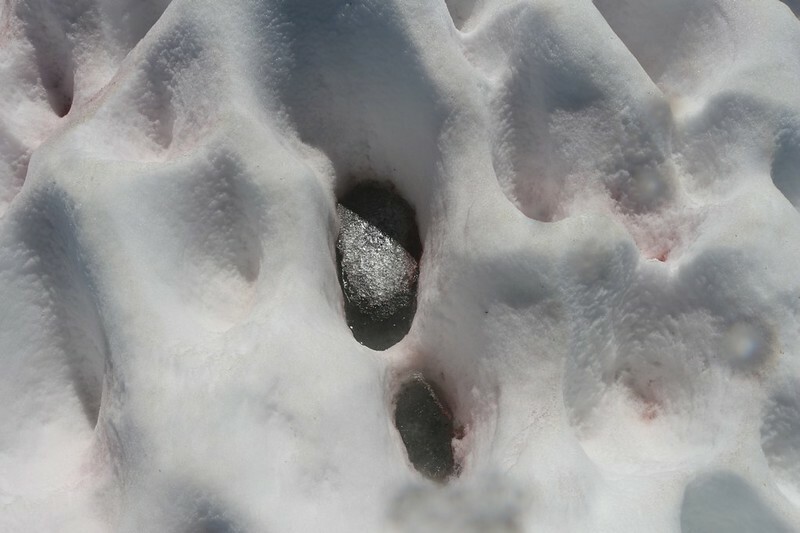 Water with a skin of ice down at the bottom of a three-foot-deep sun cup – don’t step there! 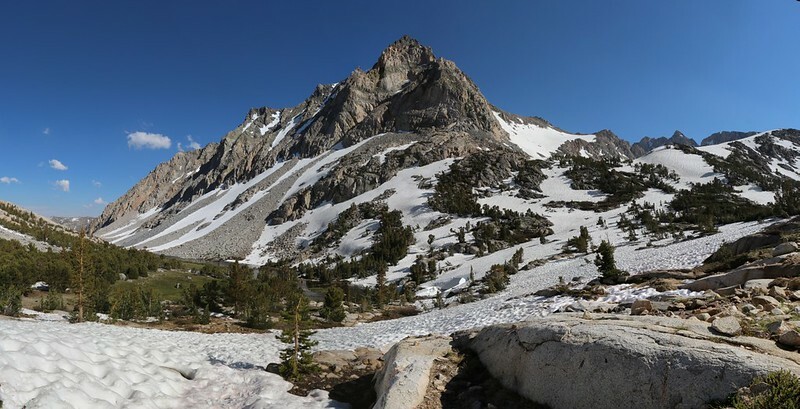 Our route proved to be better than the way up, as we managed to hike 2.5 miles in 2.5 hours, but we arrived much higher on the shoulder of Paiute Pass than we should have. The boys decided that they were going to blast straight down the steep snow slope, shoe-skiing all the way. 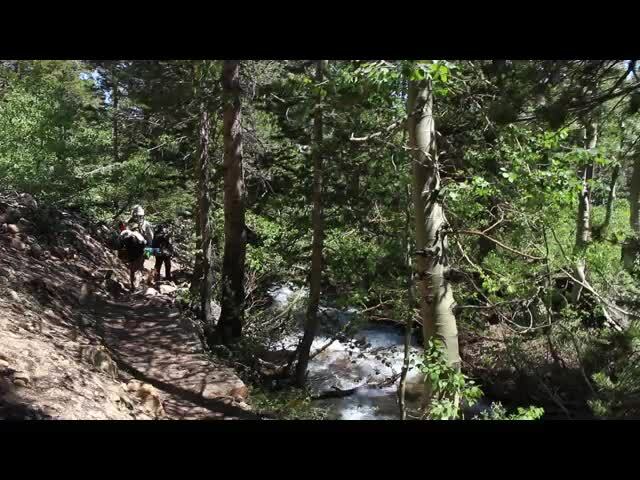 I decided to be more boring and traverse sideways over to the main trail. Both of us enjoyed the descent. It was so much better than climbing in that slushy stuff! 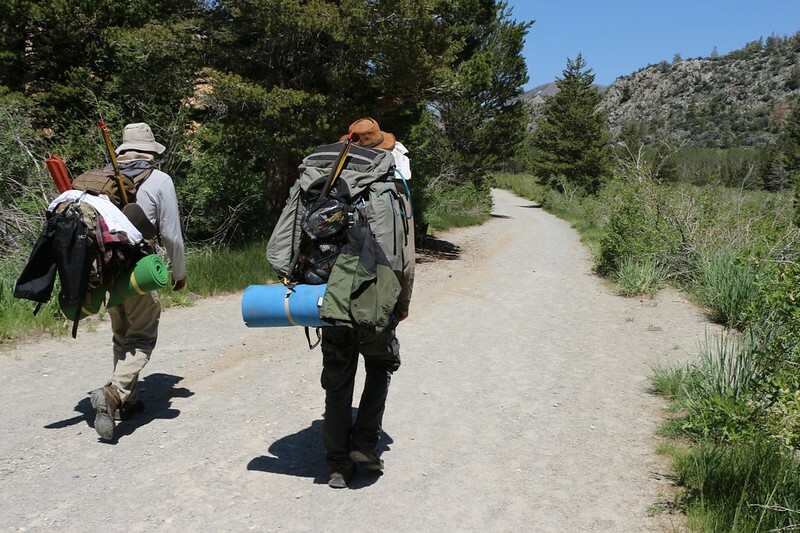 They waited for me at the bottom, and away we hiked, heading downhill to Paiute Lake. We cooked up one of our extra dinners for lunch down at Loch Leven, hanging out in the shade of a pine tree. It was good to relax a bit, as our pace had been swift. All of us had wet shoes by this point, and I think that our main goal had changed: We wanted to reach the car primarily to put on dry socks and shoes! After our break, there was only one last section of snow, the part below the headwall at Loch Leven. 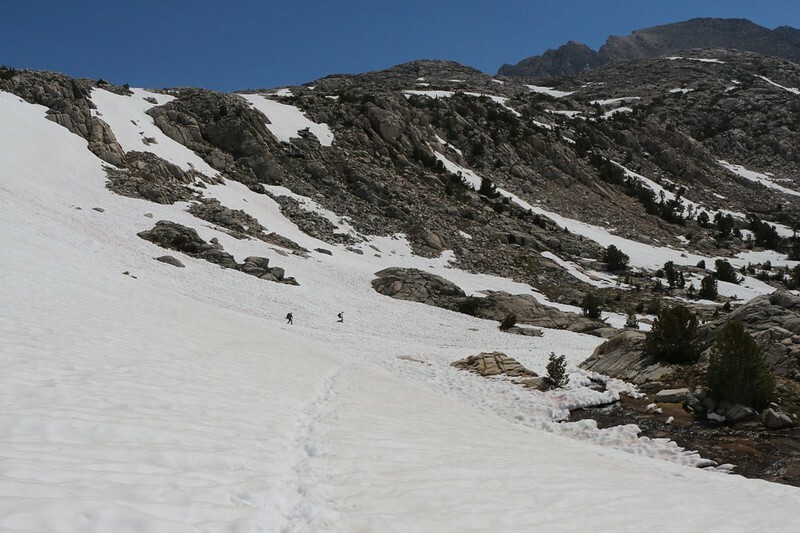 This time we heard from another hiker that one could bypass the snow just below it, and that’s what we did. Soon enough, we were flying down the switchbacks, but this time we were less concerned about avoiding the wet and muddy sections. In other words: We plowed right through them. Water didn’t matter anymore. In fact, we were moving so fast through the forested section that we never even noticed any mosquitoes! It’s amazing what downhill hiking can do. Our feet and legs were awfully sore by the time we reached the North Lake Campground, and then we had to hike that final hot flat mile on the dirt road to get back to the cars. It was roasting in the sun. When we reached the cars the first thing I did was start it up and turn on the air conditioning. Then I went back and got some cold soda and my dry shoes. I sat inside the cool car changing socks and gulping down soda. I think the boys were jealous. Then we changed out of our stinkiest clothing and put on something a bit fresher, so that we could buy some fast food in town without driving away all the other customers. 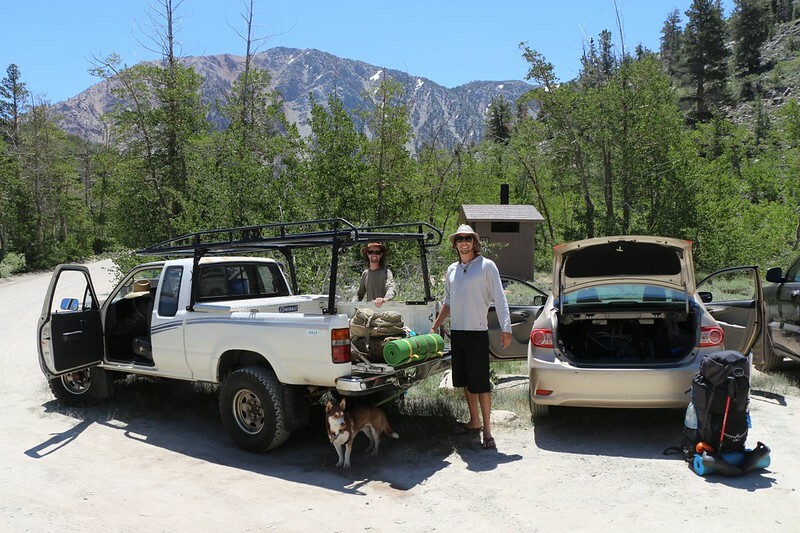 We packed everything into the cars and headed out, another trip to the High Sierra under our belts. But this time we decided to come back in September: Maybe by then all that snow would be melted!